My name is Mod, I am an experienced Thai language teacher and entrepreneur. I deliver one-to-one training alongside my teacher colleague Pear to anyone interested in learning a new language. In our experience, one-to-one training is the most successful formula when learning a language as complex as Thai. Our Thai lessons focus on “realistic Thai” language, meaning sentences and usage that will make you sound like an actual Thai person rather than a text book. We use tailor-made materials which ranges from beginners to advanced level and to apply them according to the level of the students and their needs. Your location is no obstacle as we can use Skype for on-line training. Our preference is always to meet the student one-to-one whether it is on-line or off-line for a complimentary session to find out what the student wishes to achieve and how we can best work together. On this site, you’ll find all the YouTube lessons together with written explanation for each lesson. In addition, you can enjoy the regular blog posts about Thai culture & traditions and in fact any kind of Thai related matters! As Ludwig Wittgenstein, the philosopher, said “The limits of my language means the limits of my world”. Let’s open another world in Thailand for you and you will find how fun and easy Thai language is. A couple years ago the guys at Bangkok Podcast invited me to do an interview. This is a good opportunity to hear me talk about tips to learn Thai language. Here’s the link. Have a listen. The interview with me starts at 08:00. I spent a lot of time in the US learning Thai from expensive audio tapes and courses. However, when I got to Thailand I was frustrated that much of what I learned wasn’t real Thai but rather outdated book Thai that didn’t sound natural to Thai speakers. Furthermore, I was speaking with incorrect tones and Thais did not understand what I was trying to say. Thankfully I came across Mod’s YouTube videos and signed up for sessions with her. Mod has an impressive background that is rare amongst Thai teachers – she graduated from a top university in Thailand and has years of business experience. Her English is excellent and she is extremely professional, polite and patient. She prepared personalized materials for our session with real Thai phrases. I thoroughly enjoyed my sessions with Mod and look forward to learning more Thai from her in the future. After a few holidays in Thailand and becoming enchanted by the Thai people, I decided to give myself 5 years in my hometown of Sydney before moving to Thailand permanently. This gives me the chance to learn the Thai language at my own pace before moving. Unfortunately I discovered the Thai language teachers in Sydney are either prohibitively expensive or somewhat lacking in their ability to teach. Mod on the other hand is absolutely fantastic and represents great value. After being recommended her on an internet forum (and then viewing her Youtube videos and Facebook page) I soon became a student of hers. I quickly discovered Mod has all the attributes of a great language teacher – patience, preparation and resources, professionalism, reliability, expertise on her subject matter and an excellent command of English grammer and diction. Most importantly however, Mod brings an absolute bucketload of enthusiasm, encouragement and positivity. I have progressed quicker than I thought I would and really enjoy my classes. Whether you are an absolute beginner or seeking to converse at business level, I thoroughly recommend Mod either in Bangkok or via Skype. I first started learning Thai informally through friends and progressed onto online videos, audio CDs and websites. Initially, I was prone to making grammatical mistakes and rehashing memorised phrases rather than “really” participating in my conversations using what I learnt. I definitely sounded foreign or ‘dtaang chaat’. There is a gap between formalised Thai often taught in textbooks and classes that do not cover every day spoken Thai. I started learning with Kru Mod for about a year. I find that nothing beats 1-to-1 training in terms of accuracy (appropriate use of words, context, situational awareness etc) and pace. You can learn really fast as compared to traditional methods. Kru Mod is extremely patient and encouraging; her lessons tend to focus on real-life situations and teach you to be versatile; with keen emphasis on sounding local and politeness. It is incredibly easy for Kru Mod to help you convey in Thai what you originally meant to say in English; without loss of meaning or tone. Since learning with Mod, my interactions with Thai friends have been livelier and it is easier to fit in when you sound more like a local. Whether you are just starting out or keen to improve, I’m sure Kru Mod will be able to help you meet your objectives in learning Thai language! Kruu Mod (Teacher Mod) is a famous internet celebrity in Thailand. 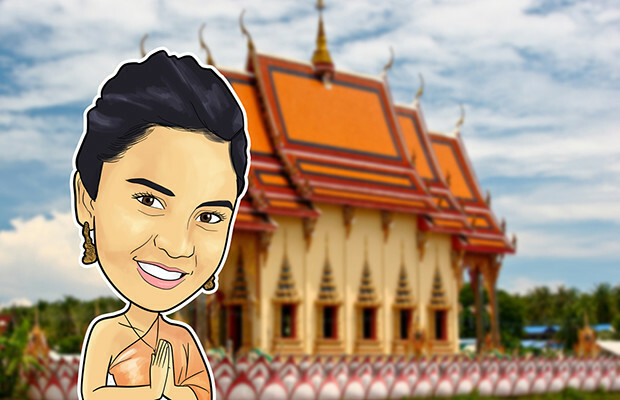 She started to create videos for both foreigners inside and outside Thailand to make learning Thai fun and easy. 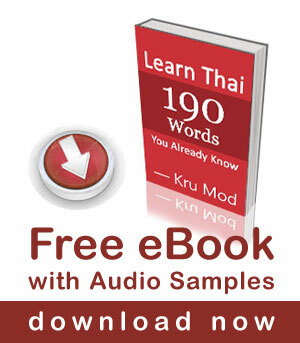 Via her website: Learnthaiwithmod.com her students can read about Thai language and Thai culture. I was born here in Bangkok but I moved to Nakhon Si Tamarat with my family, it’s a town next to Suratthani. How long have you been in Bangkok? I’ve been in Bangkok for over 10 years. I moved here when I was 18 to attend the University. But every two months I visit my hometown; my family still lives there. Do you have any other member of your family here? Yes. My brother who you have seen in many of my videos is here too. I studied accounting and I worked for an audit firm for two years. I didn’t like the business environment and so I switched to teaching. I started teaching for a school, but then decided to do it on my own. I wanted to teach English to Thai people but then I realized it is better for me to teach foreigner Thai. Do you use books when you teach? I create my own materials and send to students before each lesson starts. In the beginning I was using books I bought from bookstores, and then through experience I developed my own style and method of teaching. I try to focus on how local people speak, a more casual way of speaking Thai and I use slang as well when teaching. My office is in my home, I also do meet up with some students who prefer doing that than doing it online. We meet at café’s in Phromphong or Ekamai area. What gets me going is the interaction with different people and the progress I see as our lesson continues. Seeing them able to use what I teach them is my greatest motivation. Do you give out homework’s? I always encourage homework’s to move faster. It is more of conversational test to see where they are and how to proceed with the next lessons. You’re a star on the Internet and many people know you. Do people recognize you? Yes they do. They ask ‘Are you Miss Mod?’ It’s amazing how technology reaches people around the world. How many subscribers do you have now? My previous YouTube had more than a million views. Did you fight with YouTube? Well I wrote a letter to explain the situation but it wasn’t really a fight. I didn’t want to wait for the final result, so I created a new channel called “Thai with mod”, edited the old videos and uploaded it to the new channel. How did the idea to make videos start? When I started to look into the Thai learning market, I saw that only a few did videos. A lot of school still uses the old traditional way of teaching. And also from experience, I learned from movies too. I can’t make movies but I can do small clips. People learn quickly from videos and it is much more fun. I’ve made 60 videos in total. It’s a one-woman team. I edit and film on my own. I used different tutorials on how to edit a video and followed them carefully. For my future videos I would like to film more outside and in natural settings. I am also developing a package for downloading, videos for sale if you don’t want to go online. This way they can learn whenever they want. It will have different contents and much more developed. The free videos will remain there of course. Is this something you are doing full-time? Yes this is a full time job for but sometimes when I don’t teach I write articles for my website. In your videos often you involve your friends or family. What do they think about what you’re doing? They are very supportive and they always help me with new and creative ideas. On your website you quote “The limits of my language means the limits of my world”. How did this apply to you when you started to learn English? I think learning a different language opens doors to other culture if I didn’t learn a different language I wouldn’t meet different people from all over the world. If a foreigner learns to speak Thai maybe 70 to 80 percent of Thailand will open to you. Do you feel the same? If you don’t speak or even try to learn the language you can’t go deep and get to know people. I think if you don’t speak the language you can’t grow and learn the culture. If you do speak it will take you further and makes you understand Thai people and how they think. If I go to Europe without the language I also wouldn’t be able to understand them, it’s the same. Speaking about being able to speak and understand Thai, what do you think is the biggest misconception for people who would love to learn Thai language? It would be that Thai language is difficult, Thai language is ok to learn. You’ll be able to quote simple structure ones you learned it. Yes it is challenging but I always tell my students don’t worry about the tones they will understand you because of the context, just go ahead and speak. If you look at all of your students, what in general is the most difficult part about learning Thai? The most difficult part is the tones and hearing the tones. But of course after a lot of practice you would be able to hear the difference. Learning those words will come to you if you repeat it and use it everyday. What would be the best and most efficient way to master the Thai language in your opinion? The most important thing is motivation. I always ask what is their motivation. The motivation is the key. Don’t be afraid making mistakes. We are always happy to see a foreigner speak Thai We learned English from books and we didn’t have the courage to talk to foreigner so we didn’t talk… It is all about courage and learning from mistakes. Obviously all your students make great progress. Can you share a particular ‘success’ story with us? One student living abroad was about 60 years old and wanted to speak and read Thai, he was really motivated and after 6 months he spoke fluent Thai. We don’t speak English anymore when we speak to each other. Did you have any funny or weird experiences with a student? Just a couple of wedding proposals. LearnThaiwithMod is growing very fast, and recently you even added a new teacher to your team. What will the future bring? It is growing very fast. At the moment as I’ve mentioned I’m focusing on developing downloadable products and keep creating videos. Bangkok is a big and crazy city. How is she treating you? What are the good and bad sides about living here? I am a big city person and I like it. I like to eat various foods that you don’t get on the countryside. Bkk have rooftop bars etc. I don’t like the traffic but I enjoy the big city life. How was it when coming here? My parents brought me here for a holiday and from that moment I knew I will someday live in Bangkok. If you could recommend a place to go for people to have a nice dinner. What place would that be? In Thonglor area I like because of the diversity. What place would it be to have a drink? I usually drink where I eat and honestly I don’t drink much. And what place to dance the night away? I love to dance when I was younger I went a lot to clubs in Thonglor but now I go more for the type of place where you can have a normal conversation. But last time I went clubbing me and my friends went to Levels Club in Soi 11. If you could reach out to people who are having a hard time mastering Thai language. What good advice can you give them? Don’t be afraid of making mistakes. Just go for it and keep practicing. I watched English movies everyday and listen to English songs and that’s how I enhanced my knowledge in English. Did you ever go to the US? I did when I was 21. I went to the exchange student programme. I had an opportunity to stay in the US for 3 months because of the programme. I learned a lot from that experience.